Golf is a game of DISTANCE and VISUAL STIMULATION, a game of precision more than power. Length in itself does not constitute quality design. Each hole should stimulate the golfer to THINK about his shot and be able to CONTROL THE BALL. The golf architect's primary task is to route 18 holes in order to take the fullest advantage of a property's natural features. The idea is to discover as many holes as possible with at least one existing natural element to distinguish it. The architect must discover the correct routing through the natural terrain, thereby claiming it's advantages. Asthetics is an important design element. 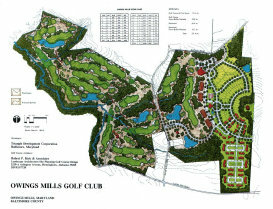 Let the natural features of the land dictate the strategy and playability. No matter how much land is carved out, the end result should be naturalness. As if the course has always been there and you just found it. Variety and playability make for a memorable golf course. Each hole should have a uniqueness of its own in relationship to the lay of the land, working with the site's topography to the utmost. The spirit of golf is to dare a hazard and by negotiating it, reap a reqard, while he who fears or declines the issue of the carry has a longer or harder shot for his second. Great care and thought is emphasized in the placement of hazards so they "fit" into the total strategy of each hole. Make the hole difficult enough to hold the interest of the accomplished golfer without so many hazards that the weaker fellow becomes exhausted. Fairway hazards are only placed to make the optimum line of attaching to the green risky. A clear advantage is gained on the approach when successfully making a significant carry from the tee. The strategic location of the hazard requires the golfer to weigh the risk of driving over the hazard against the advantage of lesser position for his subsequent shot to the green.